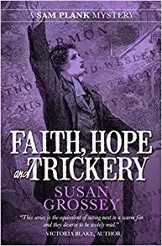 Faith, Hope and Trickery is set in London in the summer of 1828. The book opens with a bootmaker seeking out Constable Sam Plank at the Great Marlborough Street police office to report that his sixty year-old leather cutter has admitted to killing his wife of forty years. When questioned by Sam, Josiah Welford says "the message told me to do it". As Sam makes further enquiries he learns of a possible link to open air Methodist meetings in Bethnal Green. Sam attends a meeting to experience (at first-hand) what occurs. He takes along his wife Martha to appear less conspicuous - a move which eventually causes some problems in their normally harmonious household when Martha continues to attend without Sam. Meanwhile, Sam suspects that the sincerity of these meetings is being compromised in some way. These conflicting views inspire the book's title and much of its plot. Sam is assisted as always by Constable William Wilson. There is a wonderful warmth between them and Sam's wife Martha, which contrasts with the cold, hard reality of life in the areas where they live and work. The relationships of the central characters are close and have a comfortable feel but the harsh and gritty side of London life is not ignored. This is a descriptive book, with vivid images and at times aromas. It is easy to imagine being in Martha's kitchen or at an inn enjoying an ale with Sam and William, or to catch the biting smell in the vinegar yard at the corner of Old Street and City Road. There is a real sense of authenticity without the reader feeling they are being treated to every piece of research by the author. The use of appropriate terminology adds to this overall impression - with a glossary for the more unfamiliar terms, some of which have a charm of their own. This is the fifth book in the excellent Constable Sam Plank series but it works equally well as a standalone read.